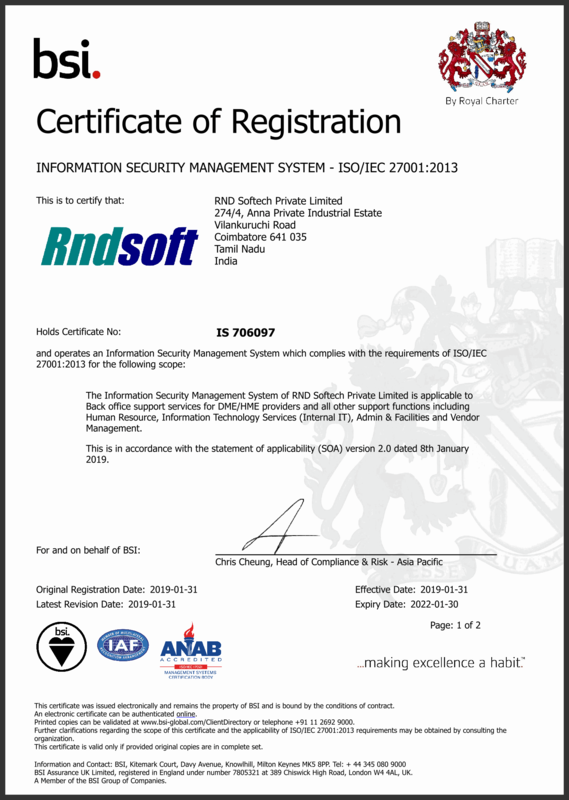 The ISO 27001 certification assures that our organizations keeps information assets secure. THE ISO 27001 CERTIFICATION ASSURES THAT OUR ORGANIZATIONS KEEPS INFORMATION ASSETS SECURE.THE ISMS SYSTEMATIC APPROACH HELPS IN MANAGING SENSITIVE INFORMATION TO REMAIN SECURE. THIS INCLUDES PEOPLE, PROCESSES AND IT SYSTEMS BY APPLYING A RISK MANAGEMENT PROCESS. RND Softech Private Limited is a leading business process outsourcing organization that envisioned and pioneered the adoption of the flexible global business practices that today enable companies to operate more efficiently and produce more value. !